Using mockups is a great way for your customer to visualize their logo or design as a finished product. A mockup is a virtual representation, which can be used for proofing your customer and even marketing your products and services. A quick Google search will yield plenty of results. Some of our favorites were found on Creative Market. You'll find everything from hanging shirts to folded shirts, people wearing shirts, as well as non-apparel items. There are even options for specific name brands like Gildan, Next Level, Bella + Canvas, American Apparel, Anvil, and more. Find one that suits your needs and download. 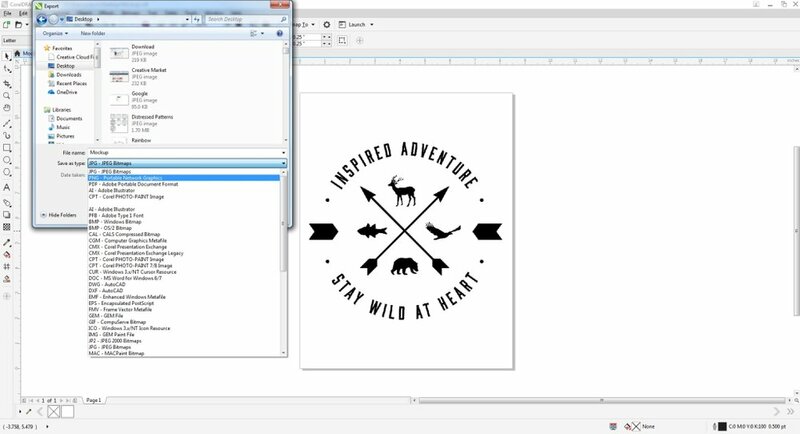 Export your vector artwork from Corel or Illustrator as a PNG file. Be sure to select the background color as transparent. Open the mockup you downloaded in Photoshop and find the layer where you will edit the design. In this file the layer is named "Your Design". Double click on the layer and it will open a new tab. Delete or hide the previous image and place your PNG file onto the layer. Using the free transform tool (found under Edit or shortcut Ctrl + T), edit the size and placement of your design. Save this layer and close the tab. It should save your changes in the original file. You may have to do this step again to get the placement correct on the garment. Use the placement guide layer if you need it. Lastly, change the color of the garment using the appropriate layer. In this mockup the layer is named "Color".